Isle of Wight in a Campervan! The Isle of Wight is England's hidden gem. Pretty beaches, quaint towns, flourishing groves and many an interesting attraction with a 1950's feel will leave you wishing you could spend longer on the wee 384km squared isle. 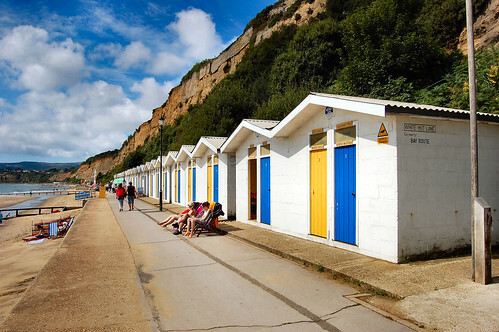 6ish kilometres off the southern coast of Hampshire, jump on the ferry with your Campervan at Southampton and head on over to this popular holiday destination. Slightly warmer than the rest of the UK, and occasionally compared to the Caribbean, it is the prefect spot for a short roadtrip with the family. Spend some time in Cowes before heading east through farmland to find quaint towns nestled beside the sea. Stroll along beachfronts or let the kids run wild on sandy beaches or have a splash in the sea. The attractive village of Seaview further along the coast will delight, and be sure to visit the ruins of St Helen's Old Church and have a cup of tea from your campervan at St Helens Dulver. If it's low tide, you'll be able to access Priory Bay around the corner, which is absolutely lovely. But hey, if it's not low tide yet, the great thing about a Camper is you can hang out in there until it is low tide. Set up the dining table and have a sandwich, or lay back and read your book. From there, head south around the island, passing through woods and rocky cliffs to get to the viewpoint above Blackgang Chine. From here you can see the chalk cliffs of Freshwater and walk up to St. Catherine's Oratory- "the Pepperpot". Up the coast at Compton Bay, experience some intriguing ancient remains - Dinosaur footprints set in the clay. The kids will be impressed, if not yourself. All the site-seeing and driving may be getting you tired. Here are a few options (of many) where you can park up the Camper and rest your eyes for the night. Grange Farm at Brighstone Bay. Continuing on with the journey... If you've taken your bikes with you, the Isle is a fantastic place to cycle. Cycle around a town, sighting the handsome buildings and regal churches or on some of the 200miles of cycle paths around the isle. 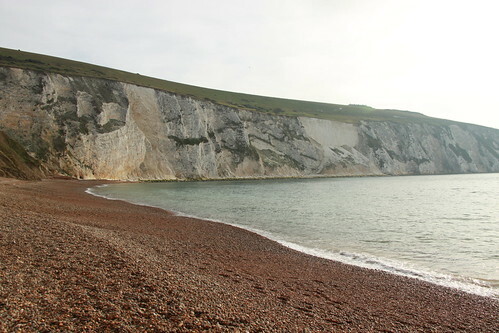 Skim some rocks at Alum Bay, gaze at "The Needles" and perhaps go up the cliff in a chairlift to the small amusement park. But don't neglect inland. Parkhurst forest is a lovely place for a stroll and a picnic, remember to look out for the island's red squirrel. Newchurch is home to The Garlic Farm. This is a great place to stop for a bite to eat in the scrumptious cafe or take a ride around the farm in a tractor trailer. The isle is small enough to explore the whole thing in your campervan but big enough to have a diverse range of sights and attractions. 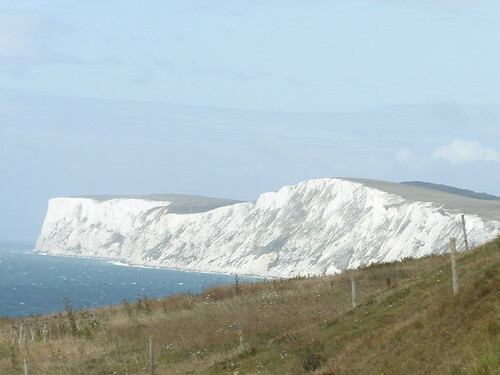 Find a Campervan at Campervan Hire Sale Finder and have a lovely holiday on the Isle of Wight. Parc Omega is a sight to see for anyone visiting Quebec. Located between Ottawa and Montreal, just north of Montebello, it is a Canadian Safari- a wildlife park. The main attraction is a ten-kilometre nature route during which deer, buffaloes, bears, and many other animals can often be seen. Visitors to the park can drive the route and see these wild animals close at hand. there are also opportunities to get up close and personal with some of them. Obviously bears and wolves are off-limits, but you can feed and touch reindeer, an amazing experience. During the summer months, there is a Birds of Prey show that is certainly worth a watch. Watch out for traffic jams caused by hungry deer! A new attraction in 2010 is the Maple Sugar Shack, where you can see how the trees make Maple and how it is collected to make the Canadian staple of maple syrup and other sweets such as taffy. The rates at Parc Omega are very reasonable compared to similiar attractions, currently at $17 per adult and $12 per child. If you are in the area, be sure to add this to your road trip- imagine perusing bears and buffaloes from the comfort of your motorhome! Check here for great Canada motorhome rental deals! Thinking of a motorhome roadtrip in France? If it's summertime, the coast is the place to go. France's most famous coastlines are those of the French Riviera and the peninsula of Brittany (Bretagne). Both of these are beautiful parts of the country, and if you are looking for glamour, the Riviera is where it's at! However, they are extremely popular as holiday destinations, and there is the degree of commercialism and crowds that come with that. If you are looking for a hidden gem, try the southwest coast. This is the coastline of the Aquitaine region that extends from La Rochelle down to the Spanish border and Basque region. This coast is a favourite for those in the know- many of its visitors are from Germany and the Netherlands and return every year! It is a chilled out part of France, and the locals certainly don't have the stereotypical snottiness attributed to Parisians and other city-dwellers. Most you meet are surfers, and in the summer the population swells as the fun-loving seasonal workers arrive. These are multicultural, well-travelled young people who work hard as chefs, wait staff, surf teachers and bar staff and play just as hard. And the area is a natural playground- the coastline is one long stretch of surf beach broken only occasionally by rivers and estuaries, and backed by charming pine forests. At the north of this region is the city of Bordeaux, known for its wine and beautiful architecture. It is on the UNESCO world heritage list for its outstanding urban architecture, so take a day to wander around and take in the best of urban France. It has recently undergone a clean-up, with buildings being sand-blasted clean by mandate- this has made for a lighter and fresher city. Trams make it easy to get around. A bit further south is Biscarrosse and its seaside partner, Biscarrosse-Plage (beach). Surfing is great at the beach, and it's great for kids too- bring a bucket and spade, and head to the inland lakes for tranquil waters. The town and beach town are a sign of things to come if you are heading down this coast- long stretches of sand, friendly and fun people, forest tracks for cycling and walking, a relaxed and unsophisticated air. The resorts keep coming as you continue down the coast- the large town of Mimizan and its beach resort, and the wonderful small town of Contis-Plage, where the endless beach is broken by an estuary. Here you can have lessons at the friendly Ecole de Surf, get a beer at the bar run by english Contis convert Dan, do some stand-up paddle on the estuary or climb the distinctive black-and-white lighthouse. Contis is a must-visit! All down this coast the food is great, with a lot of seafood being used in the restaurants- a favourite dish is moules-frites, and foie gras and duck dishes are also a specialty of the area. Further down the coast is the seaside town of Moliets with the same relaxed vibe, great beaches and surrounding forests. You can also get a game of golf in here! An estuary called the Courant d'Huchet flows into the Atlantic here, and there is a lake which is popular for fishing. Continuing down the coast, you will find the side-by-side cities of Hossegor and Capbreton. These are not as small and friendly as places like Mimizan, Contis and the like, but retain the relaxed and sunny atmosphere. Hossegor is known as the surf capital of France and is beloved by surfers the world over for its consistent breaks. It is a bustling place during the summer months, and there are many other activities to be done there and in Capbreton- horseriding, golf, tennis, sailing and much more. Restaurants and bars are plentiful and the nightlife is lively. Labenne-Ocean is another beautiful small beach town that swells in summer. The pine forest is omnipresent, and the nearby March of Orx is a protected natural reserve. It is home to many birds, and twilight birdwatching visits are often organised in summer. The city of Bayonne along the river sprawls to meet with the stunning city of Biarritz in the Basque region. Here, place names are in both french and basque giving the area a unique culture. Biarritz is an amazing city bordering a craggy part of the coastline, with beaches, inlets and protruding headlands such as the famous Rocher de la Vierge. Surfers cross paths with businessmen on the streets of Biarritz, and you could be forgiven for imagining yourself in Surfer's Paradise, Australia, rather than France. Wandering amongst the cosmopolitan streets of Biarritz, you will be continually catching glimpses of the Atlantic- it is a city not to be missed! France's southwest coast is often overlooked by those who haven't been before, but is an excellent alternative to the glamorous cities of the Riviera or the quaint touristy Brittany. If you want a laid-back road trip with friendly people, surf beaches and beautiful small towns and cities, give the Atlantic coast of Aquitaine a go- it won't disappoint! For great deals on France Motorhome Hire, click here! 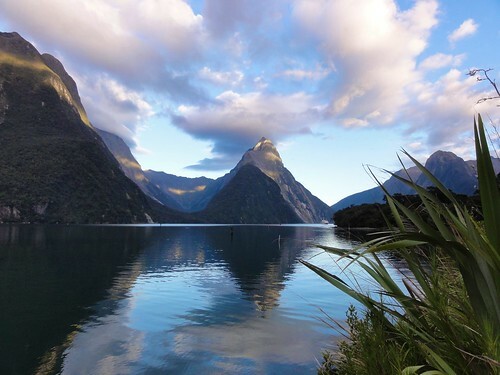 Said to match, if not out-do any scenic trip in Europe, Milford Sound in New Zealand's Fiordlands, should be a 'Wonder of the World'. This untouched fiord in the Southwest of New Zealand is a must-see destination for all who seek to find the most beautiful vistas in existence. The drive from Te Anau is fascinating enough. Driving through the kilometre long Homer tunnel descending more and more each metre, you may think you're heading into the depths of the mountains. Once you've reached the light at the end of the tunnel, you'll emerge at the foot of soaring mountains and cliff faces. Wind your way along the meandering roads, through beautiful scenery and past lovely lakes to reach the Sound. The sound has been carved from hard granite mountains by a glacier. Get yourself onto one of the ferries and explore this exceptional area. The sound and mountains are so vast they even made the QE2 look small as she meandered around in the waters. 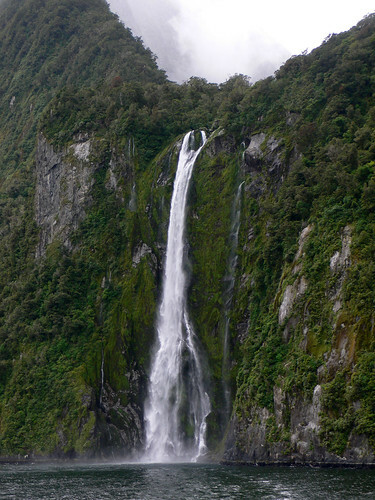 Your cruise will nose up to the many waterfalls spurred on by rain or the melting glacier and find yourself at the foot of the gigantic mountains rising straight out of the waters, Mitre peak being 1,692 metres high. 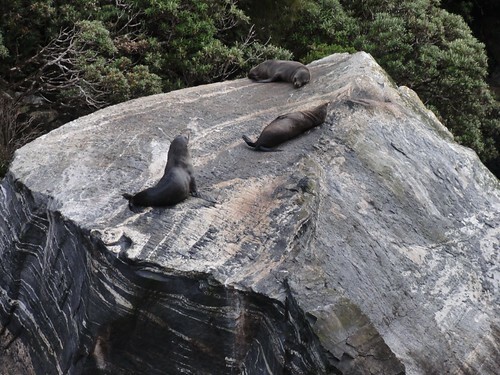 Keep a look out for the seals lounging on the rocks. Writing about it and even pictures don't do the astounding area justice. Go see for yourself... Take a campervan trip from Christchurch or Queenstown and take the journey in your own time. Find some great Campervan deals here. Couple the trip with some of the fabulous walks around the area. I know you'll have a fantastic experience! 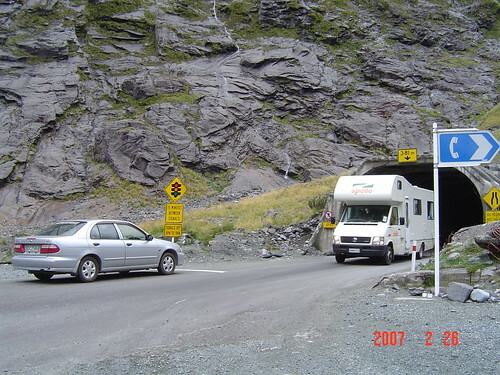 If you are looking for an easy way to find camper parking spots all over New Zealand, be sure to have a look on www.top10.co.nz. This is a network of 'Top Ten' (although there are more than ten!) holiday parks all over the country. The parks all offer some form of motel or cabin along with campsites and powered sites, and communal facilities such as kitchens, lounges and bathrooms. This makes them great for those who are travelling in a smaller or non-self contained camper- you can get out of the close confines of your vehicle and spread out for cooking, have a proper shower and meet some more travellers in the lounge. Holiday Parks are great for chatting with people, and if you are travelling with kids, they will often find friends in the playgrounds and pools. Top Ten offers a quality guarantee- where a park is branded as a Top Ten park, it means good value for money, clean facilities and spacious settings. Many also have added extras- pools, spas, tennis courts and the like. All parks have a minimum 4-star qualmark rating. If you are planning on a lot of traveling in New Zealand, consider joining the Top Ten Club. It costs $40 for a 2-year membership, and the benefits could recoup that cost very quickly. You will be entitled to 10% off any type of accommodation, up to $30 per night. You can also save 10% on interislander ferry travel, and get discounts at some local attractions and restaurants- just ask at the reception of your park. The membership extends to similiar benefits on Big4 Holiday Parks in Australia. There are 52 Top Ten parks all over the country, meaning you are likely to find one for wherever you want to go. The website makes it easy to find a park by bringing so many places together on one site, and guaranteeing the quality with the Top Ten brand. Make sure you have a look if you're planning a kiwi road trip! Have a look here for New Zealand campervan hire deals! Winter isn't the best season for a road trip by most people's standards. Less beaches and more blankets, less sun and more sniffles. However, the colder season does have it's advantages- skiing being the most obvious one. If you like the snow (and hire a campervan with heating), a winter roadtrip could be a different and cheaper kind of holiday. Another highlight of travelling New Zealand in winter is the abundance of natural hot springs which are rendered so much more enjoyable by the cold weather. Rotorua is well known for its thermal activity, and there are a multitude of pools in the area- some developed and some just naturally heated swimming holes. There is a list of them here- well worth dragging your togs out of winter hibernation for. Taupo Hot Spring Spas is near Mt. Ruapehu for a bit of pampering after a hard day of skiing, and offers spa treatments based around the thermal mineral waters as well as hot pools to swim in. Down south, there is the famous town of Hanmer Springs which is gorgeous in both summer and winter. All sorts of activities are available, but in the colder months, the best place to be is the thermal pool complex. There is a great Top Ten Holiday Park in the town to park your home whilst you soak the chill away! For great deals on New Zealand campervan hire, click here! JUCY - a new breed of RV in the USA! USA has adopted the lovable JUCY rentals to join the team of RV suppliers. The young, fun and funky minivan rentals will be strutting their stuff on the West Coast as we speak! You'll be the talk of the highway in your cute purple and green rental. Rental depots are located in Los Angeles, Las Vegas and San Francisco and as a bonus you can one-way travel between the depots. It doesn't matter whether you're used to driving RV's or not... these little babies are minivans, super easy to drive and give you so much freedom on the road. And, if you think RV'ing is for oldies, these rentals specialize in getting the more youthful travelers around the country. As a little opening present there's an exclusive 5% discount for you! Or, find one at RV rental sale finder. Las Vegas, NV 89122, USA.